In celebration of American Ballet Theatre’s 75th Anniversary, ballet’s elite David McAllister (Artistic Director of The Australian Ballet), Kevin McKenzie (Artistic Director of American Ballet Theatre) and ABT Principal Dancers Gillian Murphy and James Whiteside joined together with friends of the ballet for an exclusive evening at Sydney’s Establishment on Tuesday, March 4. Principal Gillian Murphy, who is also a Principal Guest Artist with the Royal New Zealand Ballet, spoke with Dance Informa during her visit to Sydney, in anticipation of the company’s Brisbane season in August and September. Murphy shares what her first impressions of Australia were like, her history with Swan Lake and her recent tour to Japan. Gillian, you mentioned earlier that this is your second time to Australia? Was that trip for work or for a holiday? What has your experience been like this time around? Gillian Murphy, Principal dancer of American Ballet Theatre in ‘Swan Lake.’ Photo by Gene Schiavone. What was the first thing you noticed about Sydney when you first flew in? Your tour in Japan was for two weeks. What was the highlight over there? “I love Tokyo. I have been there many times. The best part is the appreciation the audience has for ballet. In addition to that, I really enjoyed the shopping and the food, sushi in particular. These are two of my favourite things. Kevin McKenzie, Artistic Director of American Ballet Theatre, mentioned this is the first time in Australia for ABT in its 75 years. Are you excited about this new partnership with The Australian Ballet and QPAC? Kevin spoke about the essence of American Ballet Theatre that has emerged over all these decades. How have you seen dancers influence the company? “There have been a lot of influential dancers and choreographers. These include Latin American dancers who have been a force in the company and who have brought diverse cultural virtues and characteristics along with them. People from all over the world are inspiring to one another. You can see how each of the dancers inspires and borrows from one another. Mix all this together with chemistry between two dancers and it keeps the performance and movement dialogue fresh and exciting, both for the dancers on stage and the audience. Gillian Murphy and Sascha Radetsky of American Ballet Theatre in ‘Fancy Free.’ Photo by Rosalie O’Connor. Have you adapted to different styles? “I try to keep a purity of technique within the style and demands of the choreographer and character. For example, in the [George] Balanchine technique I can quickly adapt to a slightly less placed and expansive style. However, on the other hand, a ballet such as Sleeping Beauty requires a more contained English look. Other roles require the French practice that appears to be more reserved and elegant, and at other times the Russian style, which is more presentational. I enjoy playing with all those ideas. If you look at the character of Sleeping Beauty, she is coming into her own and there is the opportunity to play with those different concepts. I don’t think at this point that there is a nationalist stamp of who is expansive or contained, as it really depends on the character and direction of the choreographer. Do you prefer one to the other – Odette vs. Odile? How many times have you performed those roles? “Wow, that is hard – maybe 50 times. I did my first Swan Lake when I was 21. Yeah, I would say roughly 50 shows of Swan Lake over 13 years. Nevertheless, every night is different and you feed off of the energy that the audience gives you. It’s great because different cultural responses provide you with that energy throughout the show. The more people hoot and holler throughout the performance, the better. I love it! What a great glimpse into the world of American Ballet Theatre and the upcoming tour. Thank you for your time. I look forward to the rest of your journey later this year here in Australia. American Ballet Theatre will be performing exclusively in Brisbane at Queensland Performing Arts Centre from August 28 to September 7, performing Swan Lake choreographed by ABT Artistic Director Kevin McKenzie; and a triple bill featuring works by three of the greatest choreographers of the modern era: Jerome Robbins, Twyla Tharp and Alexei Ratmansky. 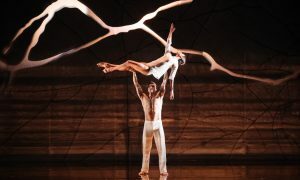 For more information and tickets visit www.qpac.com.au. Photo (top): American Ballet Theatre Principal Dancers Gillian Murphy and David Hallberg. Photo courtesy of QPAC.